Get your slim fit style on with a slim fit style velvet jacket by Tazio menswear. Tazio makes the style that you see all the famous who's who wearing but at a price you can afford. 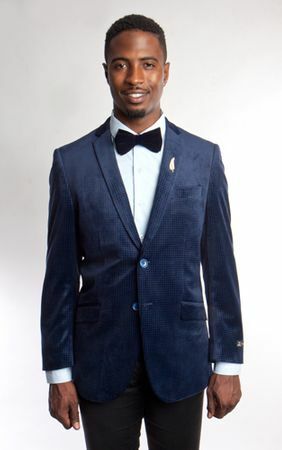 This blue slim fit velvet blazer has the slim fit style you want to be seen wearing. Featuring side vents in the back that you can work with either slacks, tuxedo pants or even designer jeans.